Currently, these missionaries work from the Missionary Training Center in Provo, Utah. A handful of missionaries are assigned there full time for the entirety of their missions to help staff the chat services on mormon.org. They teach people all over the world in online chats. So far, over the past two-plus years they have helped convert people in 42 states and 20 different countries. 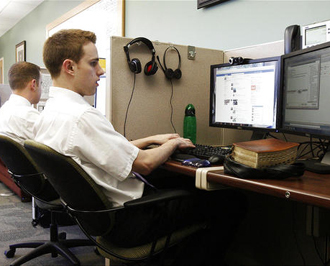 Joining them to help man the computers 24/7 are Provo MTC instructors, sister missionaries at Salt Lake City's Temple Square, and others in Mexico City and the Philippines. Many of those who decide to chat from the mormon.org website are young adults. Missionaries obtain parental permission before continuing with those under the age of 18. The person inquiring can decide upon a method of learning that is comfortable for him. Some just want free scriptures; others are searching for a local meetinghouse. Others prefer to meet with local missionaries. This is the ideal, and chats often lead to personal meetings with missionaries assigned to the location. Sometimes someone who started with the online missionaries and is being taught by the local missionaries, goes back to the mormon.org chat to re-engage — either to ask questions they were too embarrassed or shy to ask of the local missionaries or to confirm elements of what they were taught. Sometimes, requests for chats come from places where there are no Mormon missionaries. The dangers of online chat are that anonymity comes with the territory. People feel they can log in to spam, or to insult the missionaries or the Church. Thus, online missionaries have to be particularly strong in their testimonies. Online missionary service provides a venue for some potential missionaries who otherwise might not be able to serve, such as those with chronic or degenerative physical conditions that would preclude them from the rigors of on-site missionary duties. This page was last edited on 28 May 2011, at 20:10.